Today I visited my sister and her two adorable little boys. We had some fun in the sun and since Harrison's 4th birthday will be this next Monday, I thought this Wii Game would be fun to give him. It was a big sacrifice, because I would sure like to play each and every one of these fun games. 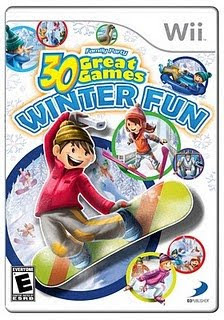 It's the Wii Winter Fun Edition with 30 excellent games. These games are all based on the Olympics. Harrison watched the Olympics with his family and he knows all about it! I actually won this game over at Suburb Sanity, an excellent secondary blog for Debbie, who has another awesome blog by the same name about her crazy, fun life as a Mom of 4 kids and marriage of almost 20 years to her husband. It really is an incredible blog. Stop by if you get a chance! Hey, I've got an idea. I can play the game over at Harrison's place and he can show his Aunt Helena all the cool stuff he can do with it. And when I get a Wii I will already have some games I actually know how to play! And here's a bonus for you! Harrison's little brother, Carter, who is so darn cute I want to grab him and just squeeze him! He calls his big brother, Hehwisee! He needs to do everything that Harrison does, so he'll probably be right there, helping Harrison play his new game! Thanks for the shout out and linky love.